Probably the most famous galaxy in the entire night sky is well on show this month high overhead in mid-evening. It is of course, the Andromeda Galaxy! It’s the furthest object that is possible to see with just the naked eye at over 2.5 million light years and is arguably one of the most beautiful such object in the heavens too. It is surprisingly large; the diameter of the Full Moon would fit inside it over 3 times! The reason you can’t see it easily, is because it is quite faint. Binoculars will help here. 7×50 or 10×50 are by far the best instruments to enable you to see this astounding object with your own eyes. But how do you find it? First, you need to find the ‘Square of Pegasus’. The four stars which make up the ‘square’ are quite easy to spot on an Autumn evening. Using the top left hand or more correctly, most north-eastern star in the square, named Alpheratz, move to the next brightest star to the east. This is delta Andromedae. Once again, move in an easterly and now slightly northerly direction to find the next bright star in the chain. This is Mirach. Here you veer off at 90° heading north and slightly west. The next brightest star which you’ll come to is mu Andromedae. One more hop in the same direction and along the same line and for the same distance you moved from Mirach to mu, will take you to the Galaxy. It is unlikely that you’ll see any structure with the naked eye or even binoculars, but what you will see is the glow of the core of the galaxy surrounded by a fainter glow from the spiral arms. A medium to large telescope will start to resolve some structure, but normally the field of view is restricted, so you will have to move around with your scope to take in the whole object. Here then, is a method to find the Andromeda Galaxy, but what are you looking at? A galaxy is an island universe of stars in space. The number of stars in this Galaxy are estimated to be around 1 trillion. It is also thought that there is a super-massive black hole in the centre of the Galaxy, although this is thought to be the case in many such galaxies, including our own ‘Milky Way’ galaxy. Messier 31, as the Andromeda Galaxy is otherwise known, is part of the ‘local group’ of galaxies. I hope you enjoy looking at our neighbour! One of the other objects of note well on display in this region too, is the Perseus Double Cluster, labelled NGC 884 and NGC 869. Again, this is a wonderful object for those armed with binoculars or a small telescope. The constellation of Perseus looks a bit like an upside-down letter ‘Y’, with the stem pointing towards the constellation of Cassiopeia. If you draw an imaginary line along from the end of Perseus marked by the star eta Perseii, towards Cassiopeia and travel along it about one third of the distance, you’ll come across the Double Cluster. This pair of open star clusters are breathtakingly beautiful and well worth lingering on, looking like diamonds scattered on to black velvet. I urge you to go and view them. 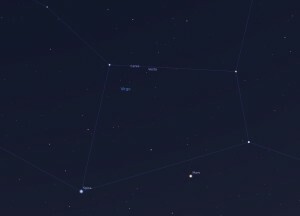 While you are in Perseus, take a look at the star beta Perseii or Algol. This is a variable star. This means the brightness of the star varies. It is one of countless such objects in the night sky, but this one is fun to watch, because it is quite bright and easy to find and varies noticeably over a period of just a few days and regularly, so it’s easy to follow. It is an eclipsing binary star, that is it consists of two stars which orbit around their common centre of gravity and when the smaller star is eclipsed by the larger, the brightness of the combined object dips. When the smaller star passes in front of the larger, the light drop is less marked, but visible nonetheless. The light dips last for a few hours and occurs every 2 days, 20 hours and 49 minutes. If you have never studied a variable star before, Algol is a great one to start with. Not far from Algol, is the open star cluster M34. You can find it approximately half way between Algol and the star Almaak or gamma Andromedae. It is nowhere near as spectacular as the Perseus Double Cluster, but it is still quite a pleasing object to observe. It is thought to lay at a distance of 1,500 light years from us. Finally, laying about half way between M34 and the star Almaak is a faint galaxy known as NGC 891. This is an edge on spiral galaxy and may even be similar to our own Milky Way. It’s a challenging object to see although it shouldn’t be too difficult in a telescope of at least 8-inches or 200mm in diameter. This entry was posted in Uncategorized on 04/11/2017 by Ninian. There are some interesting things going on in the skies this month (aren’t there always?) and here’s a quick run down of what’s happening for your delectation!.. 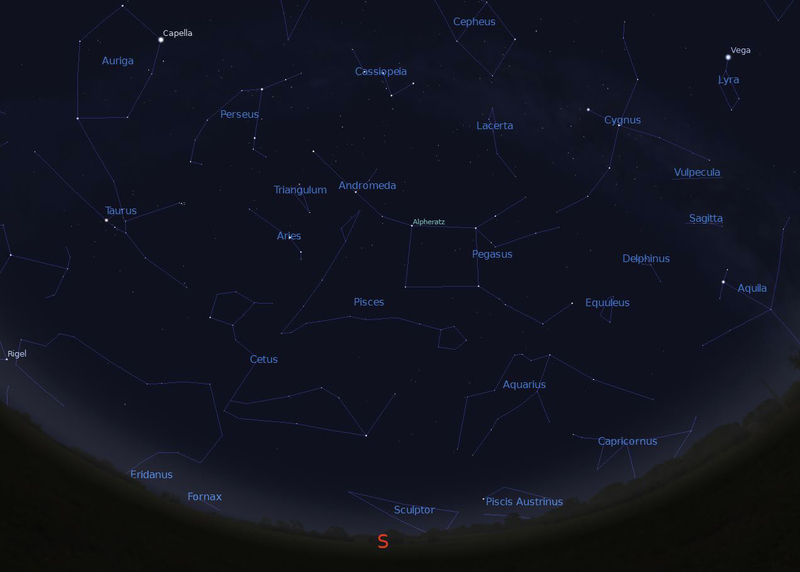 If you have yet to spot Saturn through a telescope, it’s still well placed in the sky especially around midnight. If you can draw your attention away from the beautiful rings, see if you can spot Saturn’s largest and brightest moon, Titan at its greatest elongation, that is its greatest distance from the planet, on the 7th of the month. 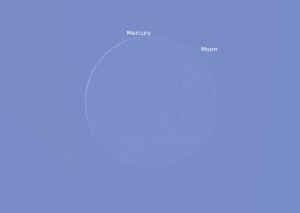 A rare occultation of the planet Mercury by the Moon occurs on the 26th. This happens in full daylight and so is going to be difficult to see, but not impossible. It happens around 1pm BST and with the Sun only 10 degrees to the east, you’ll need to take special care when it comes to pointing any optical aid in that direction! Don’t forget that the summer means sunshine (even in the UK sometimes!) and this means the opportunity to do some solar observing. Obviously you will need either special filters for you telescope/binoculars, or know how to project the Sun safely through a telescope. If you are in any doubt how to do this, then please ask someone who you trust to explain. You can of course, ask me! There will be some more information in this Newsletter about Solar observing; how to do it and why it’s fun! 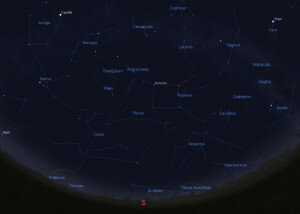 There are many other delights in the deep sky to be enjoyed this month too, if you own or have access to a telescope. Again, more on this later. If you are interested in asteroids, then the two largest, Ceres and Vesta, are moving closer together in the night sky from our point of view, called a conjunction, this month. 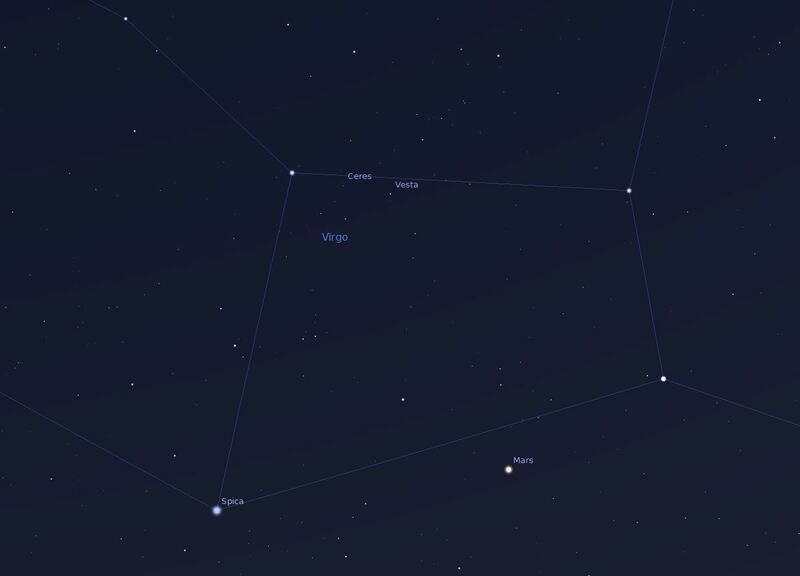 You can find them in the constellation of Virgo in the south-west after dark. The orangey-pink and bright planet Mars should help draw your attention to the right part of the sky. 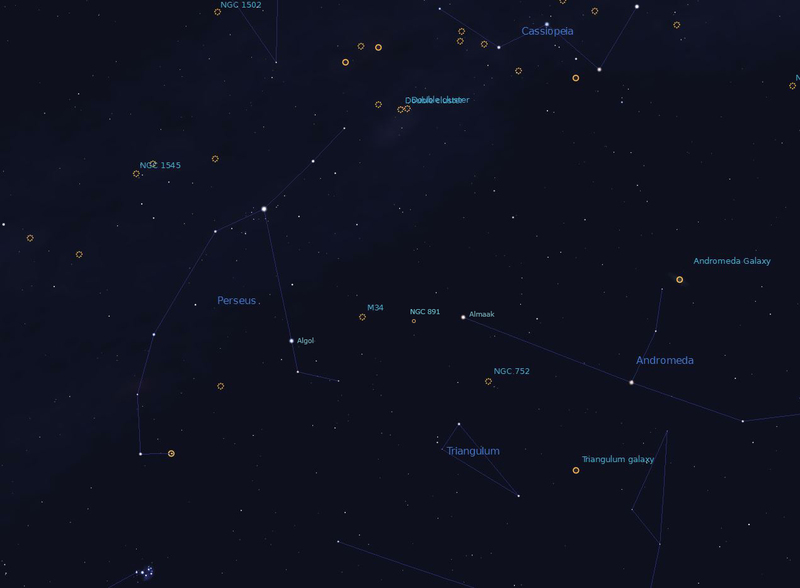 Use a star chart to be sure you are in fact looking at the asteroids. You can check by marking their position on your chart on a nightly basis. The asteroids will appear to move, whereas the background stars will not. They will be moving even closer next month, but more about that in next month’s Newsletter. If you don’t have a star chart, then you can get one here on my Amazon page. 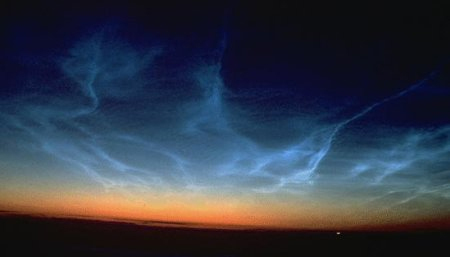 June also sees the start of the Noctilucent Cloud season. These gorgeous iridescent electric blue coloured clouds are seen an hour or two after sunset and an hour or so before dawn, low down in the northern sky and are sunlight being reflected off extremely high clouds right up in the stratosphere, much higher than the normal clouds with which we are all too familiar. It is thought that these cloud are formed around meteoritic dust lingering in the highest regions of our atmosphere. The picture shown here, by Pete Lawrence, shows you exactly what to look for. As you can see, there’s lots of reasons to get out under the skies this month, so lets all hope for clear ones. This is just a part of my monthly Newsletter, so if you’ve come upon it by exploring my blog, why not sign up for the whole thing. It’s FREE! You can do this by putting your email address in the pop up box on my website and it’s guaranteed secure and spam free too. So please click here and sign up! This entry was posted in Uncategorized on 28/05/2014 by Ninian. Firstly, buy something you can handle as far as size and weight goes. If it’s too big, heavy or awkward you won’t feel like using it especially if you’ve had a hard day at work! Secondly, consider what you are hoping to see with it. 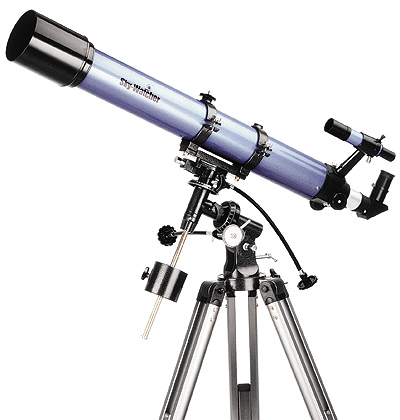 If it’s just the Moon and planets and a few of the brighter ‘deep sky’ objects then a small refractor telescope (the ones with lenses; what most people think of as a telescope) should be fine. These are usually quick to set up and need little maintenance. Some telescopes come with computer drive systems to help locate and track objects for you. Remember that this wizardry takes up a significant chunk of the cost of the scope, so ask yourself, do you need it, do you want it and will you be able to use it? If you want to see more deep sky objects then you’ll need a larger aperture (potentially heavy) and a reflecting telescope. Do bear in mind that the objects which you might see won’t look like the pictures you find in magazines or on the Internet, but you will be, or should be, impressed that you can see things which are so far away at all, and you may well be able to take pictures of them yourself. I can teach you how to do this too, usually via one of my online courses or even on a one to one basis. I have spent many years, buying, selling and using telescopes and these points are an extreme distillation of what I’ve learned after all this time. There’s lots more I could say on the subject, but that will do for now. There is considerably more information about small telescopes and how to use them in my course ‘Basic Astronomy with a Telescope’ available here. This entry was posted in Uncategorized on 30/07/2013 by Ninian. This is a piece that I always hoped I would never have to write, but always knew that one day I would. No doubt you will read and hear reports from other people, who knew Patrick Moore better than I, and with possibly more compelling stories, but I feel moved to write this nonetheless and so with sadness, I present it now. I remember as a small boy occasionally seeing a man on the television, a black and white set in those days, talking about the stars and planets. He spoke very quickly but even to my young and inexperienced eyes and ears, he was obviously very passionate about his subject. His enthusiasm was infectious and got me interested enough to ask for a book about the stars from my parents. Thus began a lifelong interest which took many twists and turns through my life. My overriding memory though, is of watching him guide me, and no doubt countless other glued to television sets up and down the country, through the Apollo Moon Landings. As a 10 year old boy I lapped this all up. 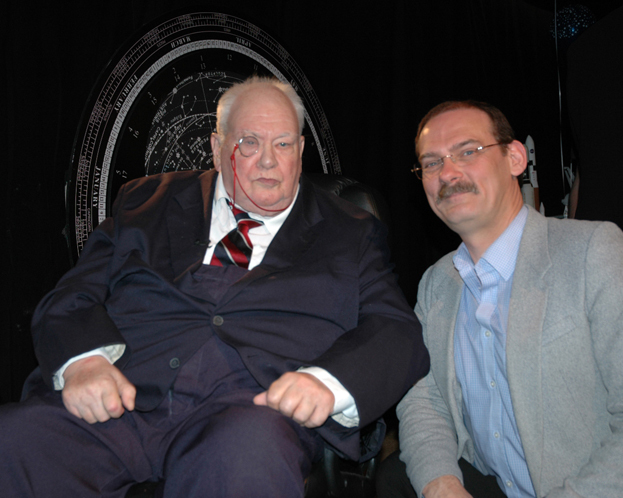 Patrick Moore was a hero. More importantly, he was my hero. Little did I or could I know back then, that I would get to know this great man personally and consider him a friend. Not just a friend, but a mentor, someone who taught me, encouraged me and helped me on my journey in astronomy and with my then business, selling telescopes. Sir Patrick was a legend in his own life time. There are very few people of whom this can be said. The wonderful thing about this man though, was that he never allowed this, quite literally, global appreciation to go to his head. Yes, he had his faults as does everyone, but the good things about him far, far outweighed any shortcomings. Some celebrities use their status for their own selfish ends, or to boost their own egos; not Patrick. He used his fame for good, to spread his enthusiasm for his pet subject and to encourage others at whatever level they felt comfortable. His generosity, both physical and spiritual, was humbling, although he never made a show of either. I would drop into ‘Farthings’, Patrick’s Selsey home for a chat or to occasionally help Patrick out with a request he would have for a telescope which he wanted to make as a gift to a promising youngster. It could be said he was generous to a fault; in fact I got the impression that, when he made such an endowment, my discretion was also called for, if not expected. On my ‘ad hoc’ visits, he never made me feel I was ever unwelcome or intruding on his day and his incredibly busy work schedule. Frequently his first words to me on arrival at his house were ‘have a drink?, a phrase I understood he used to nearly all his guests, or at least the ones who he got to know, and he didn’t just mean tea of coffee. If I indicated that I would be delighted to share a ‘snifter’ with him, I would be instructed to go into the dining room and help myself and pour him one too! ‘Farthings’ was a different world, a world of magical proportions. I would find myself chatting to famous astronomers, or sharing a cup of tea with a camera crew or television producer. Best of all were the famed ‘parties’. Patrick loved to throw parties and it was done regularly and with almost any excuse, but the excuses were sound enough, such as the 50th anniversary of the Sky at Night programme or the 666 edition of that same show, or sometimes just a simple birthday or book-launch party. I was always thrilled to receive an invitation, often delivered by Patrick himself in the form of a telephone call, which normally started with ‘Hello Ninian, Patrick here, Patrick Moore’, as if I needed the further explanation of who was calling; his voice was of course very distinctive. The house and gardens would be thrumming with the great and good of the world of astronomy, but always like the focus of a fine lens, sitting serenely in his chair in his study would be Sir Patrick. A wonderful thing to watch was the way all of the famous and highly respected astronomers, astro-physicists and cosmologists would pay their heartfelt respects to Patrick. Some would share a joke with him or an amusing anecdote, or introduce someone who had not met him before, but always there was an air of respect if not reverence of this, in many ways unassuming man, who had personally affected the lives of everyone present. Frequently a topic of conversation, out of Patrick’s earshot, would be how that person had come into the subject because of the great man. Sir Patrick was not a man to suffer fools gladly and he had a healthy loathing for pomposity or bureaucracy and could be quite outspoken at times. Occasionally he would upset people, but whatever he said, it was nearly always done with a modicum of humour and never malice. Above all though, I will remember a kind, thoughtful man with a rapier like intellect and wit, who would offer words of encouragement to a young(ish) hopeful man who was always in awe of him and could never really believe that his boyhood hero was sitting in front of him, chatting to him like an equal. It was ‘a dream come true’, although there is a part of me that still thinks it may have been just all a dream. I do have several books he gave to me to prove otherwise though, all personally signed by him, even when it was obviously painful for him to do this as he had severe arthritis in his right hand in the last few years of his life. It was truly a delight for me to be able to return that compliment when I had completed my novel and gave him a signed copy which he accepted with great humility. Like so many others Patrick, I will never forget you and I feel unbelievably privileged to have known you personally and to have counted you as a friend and even more privileged to think that you counted me likewise. Rest well old friend, you have earned your place among the stars. This entry was posted in Uncategorized on 10/12/2012 by Ninian. The Perseid Meteor Shower is probably the most well known of all the regular meteor showers. It is also popular because it takes place in August when the weather is likely to be mild and the skies clear. This year the prospects for a good display are favourable as the weather is looking promising for the UK (but you never know?) and the Moon will be a slender crescent just before dawn, so less problem from a bright glaring Moon washing out the fainter meteor events. I have noticed a few suggestions doing the ’rounds’ on the Internet and particularly Facebook that we will possibly see 100 meteors per hour. This has almost certainly come about from a mis-understanding of the way astronomers assess the ‘strength’ of meteor showers. There is a term known as ZHR or Zenithal Hourly Rate which gives astronomers an indication of how active any given shower is likely to be. It is one of those terms which refers to ‘ideal’ conditions, which of course we never have. So the ZHR means that this is the number of meteors we might see if the radiant (I’ll explain this in a moment) of the shower were directly overhead, which of course it seldom ever is, and the skies were perfectly dark and clear, which of course they never are. So you may think this term is misleading, but it is a useful way to suggest the number of events which might occur if everything was favourable and is used to quantify every meteor shower we see. In reality, we seldom see anything like the number of meteors which the ZHR suggests, but it is still a useful indication as to how active the shower is going to be. ZHR 100 is pretty active! Firstly, I should point out that the sky is not going to be full of shooting stars, not at first glance anyway, so wrap up warm (yes, even in August) and use a deck chair or sunlounger and get comfortable. Find a dark spot. It will take a good 15 minutes for your eyes to get accustomed to the dark. When they do, you will see more stars and meteors. The Perseid meteors will seem to be emanating from the north-east but will streak across the sky and can appear almost anywhere. If you see one that seems to come from a completely different direction, it is not a Perseid, but possibly from another less active shower or just a ‘sporadic’ meteor. Your best chance is to direct your gaze at least 60-degrees above the horizon, so over half way between the horizon and the zenith (the point directly overhead). Give yourself at least half an hour to just relax and count as many meteors as you can. A note book can be helpful if you would like to record the number you see. 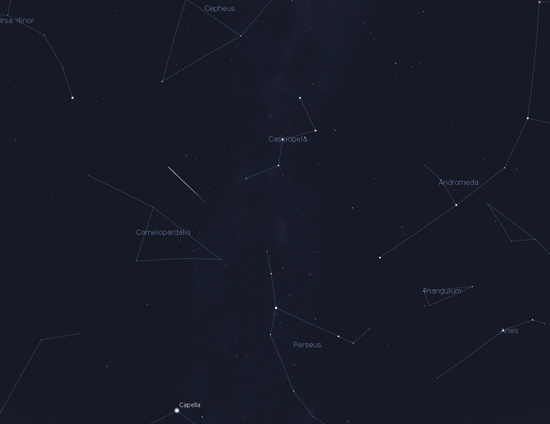 The Perseids are fast moving and if you trace the streaks of light back across the sky, they should all seem to come from a region of sky in the constellation of Perseus (see picture). This is known as the radiant point and is why the Perseids get their name. You will also increase your chances of seeing some if you observe after midnight. In fact that’s after 1:00BST because the Earth is then turning into the thickest part of the cloud of debris which gives us the meteors. The nights of the 11th and 12th of August are likely to be the best, but you may see some for a few days both before and after these dates. Don’t be too disappointed if you don’t see as many as you’d hoped, there are lots of reasons why this might happen. The true peak of the shower this year occurs in the daytime, so we will be seeing the meteors a little before (11th) and a bit after this (12th). Good luck! This entry was posted in Uncategorized on 09/08/2012 by Ninian. It’s a turn of phrase that has come to mean something happening very rarely. But where does it come from and what did it originally mean? 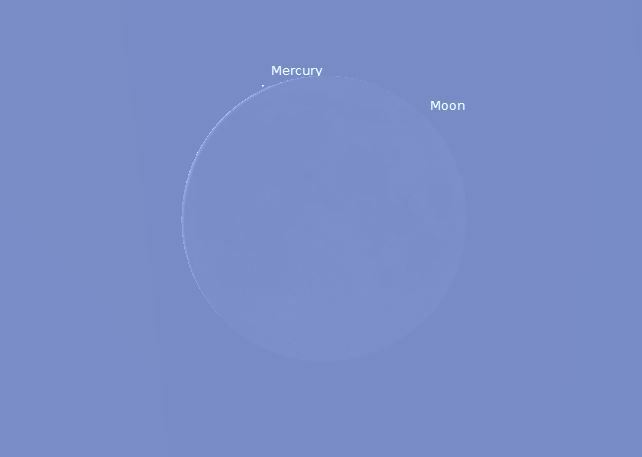 Surely the Moon is never actually blue!? Well no, the Moon is never blue, not unless you are looking at it through a blue coloured filter. What is has come to mean, is the occurance of 2 full Moons in one month, which is a fairly infrequent event. Astronomically speaking though (does anyone speak astronomy? 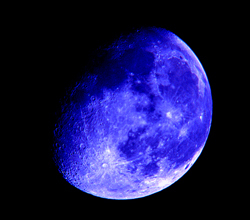 ), this is not a correct description of a ‘blue’ Moon. The term seems to have come about due to a miusunderstanding or misinterpretation. There are usually three full Moons in one season or three months. The word ‘month’ is in fact derived from ‘Moon’. A journal called the Maine Farmer’s Almanac described these full Moons as ‘early’, ‘mid’ and ‘late’ in each season. On the odd occasion a fourth full Moon was seen in any given season, the sequence was then described as, ‘early’, ‘mid’, ‘blue’ and ‘late’. The misinterpretation came about when a popular astronomical journal in the 1940’s described the second full Moon in a month as the ‘blue’ Moon. This would not necessarily match the original almanacs definition. The incorrect definition was taken up into general use and repeated in a radio broadcast in 1980 which helped to confirm the albeit incorrect definition in many people’s minds. There are on average, 12.37 full Moons in a year and therefore there is again on average, a ‘blue’ Moon every 2.7 years. If you’de like to know even more about the Moon, then take a look at the page all about it on my website here. Thanks to Pete Lawrence for the source information for this. The (highly processed!) picture of the Moon I took in 2006. This entry was posted in Uncategorized on 04/08/2012 by Ninian. This entry was posted in Uncategorized on 19/07/2012 by Ninian. for about 20 years now (!). This entry was posted in Uncategorized on 05/07/2012 by tracyportman. 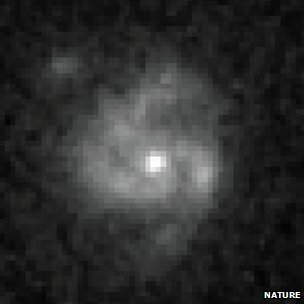 Japanese astronomers claim to have discovered the oldest galaxy yet seen. This entry was posted in Uncategorized on 12/06/2012 by Ninian.